Spring is here, and springtime means ASPARAGUS! I’ve been enjoying it since it came into season over the last month and was eager to incorporate it into a recipe. A creamy, lemony risotto seemed like the perfect fit. Parmesan cheese and lemon are two of the very best complements to asparagus that I can think of, so it’s a total match-made-in-heaven situation. And also, I pretty much look for every excuse to make risotto that I can think of. Why do I adore making risotto so much? I love that while it requires vigilance and a little bit of time, I also find it to be a relaxed, easeful, almost ritualistic endeavor. As I stand watch over the risotto, intuiting when it’s time to ladle in more stock, to stir, I’m given an opportunity to slow down and truly be present to a beautiful culinary moment. And it doesn’t hurt that this beautiful culinary moment is slow enough in unfurling that I also have time to savor a glass of wine and catch up on DVR’ed shows – most recently, the latest two episodes of Girls! – while it’s doing it’s thing. TV goodbyes – strangely as emotional as real goodbyes sometimes! How is that even possible? I guess the desire for human connection is so strong that we’ll even feel it with people that we know aren’t real if they are memorable and endearing enough. Anywho. As silly as it sounds, I’m sad about these fictional characters and the fictional world they inhabit going away, and I’ll take all of the comfort I can get right now about it. 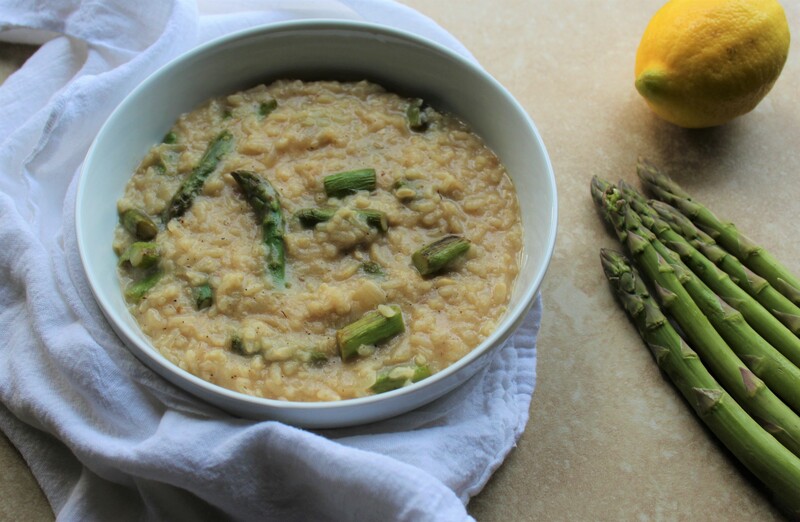 And Lemony Asparagus Risotto IS comfort embodied. It’s rich, creamy, lemony, savory goodness that feels sups fancy but is really not all that complex to make. It just takes a careful eye and a little strategy. -You’ll see that the majority of the below-described recipe preparation revolves around adding stock – a ladleful at a time – to the risotto every three to five minutes or so. Keep an eye on the risotto during this stock-ladling stage and stir between ladles as needed – regularly, but not excessively. You want to stir enough to prevent the risotto from burning or sticking to the bottom of the pan but not so much that the rice forms an overly sticky, gluey consistency. When in doubt: use your instincts and stir when you think you should. I believe it’s better to mix more than less. I stir the risotto every time I add a ladleful of stock to it and any other time it looks like it needs it. -If you find the rice is really sticking to the bottom of the pan or is absorbing the stock too quickly, try decreasing the heat. Medium-low may prove to be an ideal heat setting if your stove burners run hot, as mine do. -Resist the urge to add in more than one ladleful of stock at a time; patience is key here! I’ve found that pouring in too much stock at once often translates to the rice not absorbing it properly and the process being thrown out of whack. I hope you find these suggestions helpful as you embark on your own risotto-making odyssey and that it’s also a tranquil, enjoyable practice for you. Get that wineglass ready and fire up that DVR! Ok, on to the recipe and creamy, lemony, asparagus-laden goodness! Cut the bottom two or so inches (the tough, woody parts) off of the asparagus spears, then cut the remaining stalks into bite-sized pieces. Add them to a sauté pan with one tablespoon of the oil and sauté until tender, about seven minutes. Add the second tablespoon of the oil, the onion, and the garlic to a large pot over medium heat; let sauté, stirring occasionally, until the onion has softened and become translucent, about four minutes. Stir in the rice and let it toast for a minute or two before adding the white wine. Once the wine has evaporated and the rice has absorbed its lovely flavor after a minute or so, begin the process of adding in the stock. About every three to five minutes - when you sense that it's time - incorporate a ladleful of stock to the rice, allowing it to fully absorb each batch of stock before ladling in the next one. It should take about 35-45 minutes to add in all six cups of the stock via this process. When all of the stock is gone and has been fully absorbed by the rice, you should be left with a risotto of a wonderfully creamy consistency (if the consistency is too thick, you can add more stock or even a bit of water to help thin it). Stir in the Parmesan cheese, lemon juice, cooked asparagus, and desired amounts of salt and pepper. And you’re done! Serve immediately to fully enjoy the creamy luxuriousness of the fresh risotto.